Which Comedian Had A Recurring Role In The Star Trek Franchise? The Only Crop Banned From The Futures Trading Market In The United States Is? While there are many ways to quantify just how big of a cultural institution the Star Trek franchise is, one pretty solid way to rate its status is to look at the people it has pulled in for cameos and extended roles. Much like another cultural institution, The Simpsons, the cast logs of Star Trek movies and TV episodes are littered with famous names. Over the years, everyone from scientist Stephen Hawking to musician Iggy Pop have made appearances, and the list of actual actors and actresses popping in for a visit is even longer. In one particular instance, however, a comedian-turned-actress popped in and stuck around for a good long while. Whoopi Goldberg first appeared in the second season of Star Trek: The Next Generation as the enigmatic bartender on the USS Enterprise-D. 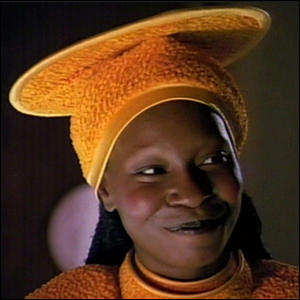 Her character, Guinan, appeared in 29 episodes over the years and in the films Star Trek Generations and Star Trek: Nemesis. Her portrayal of the character was well received by fans and is remembered fondly today. There’s a heartwarming layer to Goldberg’s presence on the show, however, that wasn’t immediately apparent to viewers (as there was a personal backstory). At the time she was cast on the show, Goldberg was famous enough that when she tried contacting the producers, they thought she was trying to prank them. After contacting the production office directly, she invited executive producer Rick Berman and series creator Gene Roddenberry out to lunch to discuss her appearing on the series. She was serious and told them that she had always been a Star Trek fan and now that she was established and could do whatever she wanted, she wanted to be part of the Star Trek universe. When I was nine-years-old Star Trek came on, I looked at it and I went screaming through the house, “Come here, mom, everybody, come quick, come quick, there’s a black lady on television and she ain’t no maid!” I knew right then and there I could be anything I wanted to be. Decades later, she was a successful performer and had a chance to revisit Roddenberry’s egalitarian future that inspired her as a beloved recurring character.